ActiveG’s unparalleled GIS/Maximo data integration experience can help your company to take full advantage of Maximo and GIS data. 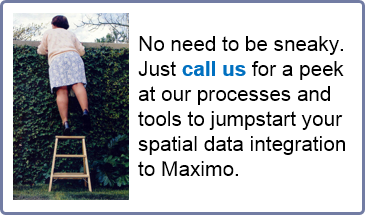 Not only does ActiveG offer great core and mobile spatial solutions for Maximo, but it provides essential knowledge, expertise, and consulting services to help you get your GIS data ready for Maximo. An often-overlooked, glossed-over part of major Maximo projects is the GIS data synchronization to support 1) spatial integration with Maximo, and 2) asset/location creation/updates in Maximo. Many companies start off their projects without the spatial integration as part of a phase 1, and they plan on “easing into it” later. However, if your company is planning on GIS integration at any point in the future, addressing the relationship between your GIS data and your Maximo asset data is a critical step to take early in your Maximo project. What are the business rules for managing field/GIS assets? How does the GIS data fit into the design of the Maximo Hierarchy? How does GIS data relate to the asset catalog in Maximo? Do your assets begin their data life in GIS or some other system? Which system is the long-term owner/maintainer of spatial assets, locations, attributes, etc.? How will Maximo and GIS data fit into core and mobile projects? ActiveG is the most qualified company to help you answer these kinds of questions using best practices developed through many years of experience. Over the years ActiveG has developed the most reliable and sustainable process and tool set to use GIS data to build and maintain your asset catalog and enable the use of maps in Maximo. No other company has the breadth and depth of experience integrating GIS into Maximo that ActiveG has. For nearly 20 years, ActiveG has been helping customers synchronize their asset and GIS data. Not only do we have the technical know-how, but we have the wisdom and experience of knowing what works best in a variety of business situations. So don’t dive into your Maximo project without first exploring how ActiveG can help you enable the most business bang for your GIS buck. Let us come help you organize your data so you’re prepared to take advantage of all the power of Maximo and GIS together. Contact ActiveG today for more information.